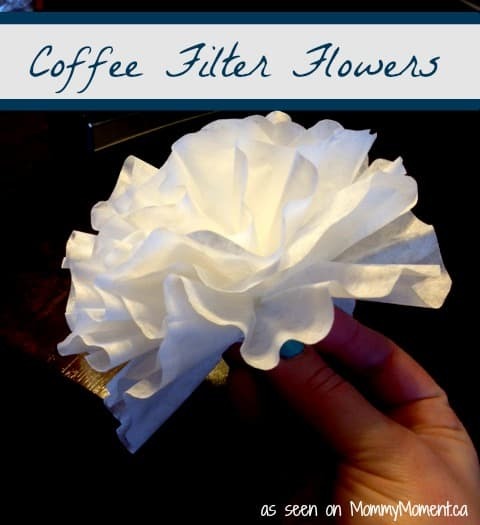 Coffee filter flowers are an easy children’s craft to make on the spur of the moment. Chances are, if you love coffee, you will already have all the supplies needed right in your kitchen! This morning I woke up super happy and looking forward to a nice spring day. Then I looked outside and saw snow falling from the sky *sigh*. I’m sure it won’t stick around for long, but mother nature really needs to get with the program! Over the last few weeks, I have been dreaming of DIY garden projects, starting a veggie garden and just sprucing up our home. So today I will introduce you to these super cute Coffee filter flowers. Coffee filter crafts are easy crafts for children of all ages to do. 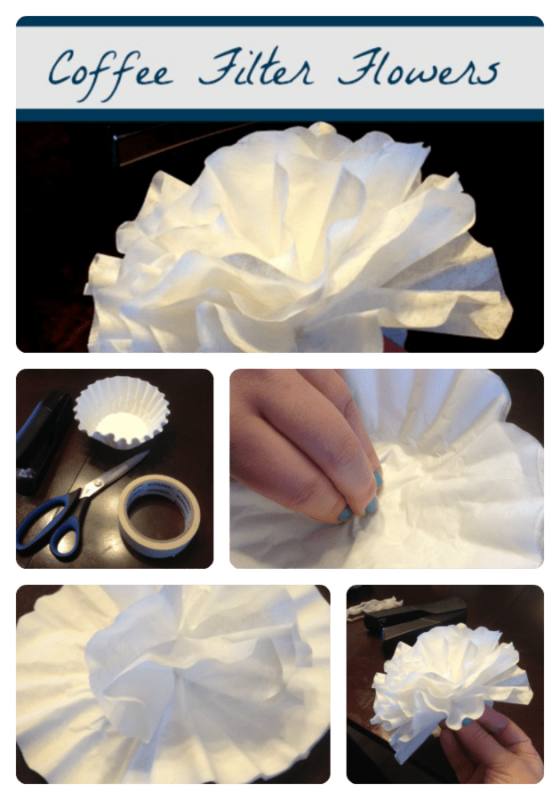 There are SO many ways that coffee filter flowers can be used, and I plan to use a lot of them in my house! You could make an arrangement and put them in a vase, turn them into a garland or wreath, or use them to decorate for a party. These can also be dyed any color your heart desires, I currently have no food coloring at home so for this tutorial you will just see plain old white, but they are still pretty. First, take 6 of the filters and flatten them out as much as you can (in a pile). Next fold them in half and then in half again and form a crease. Next, take your scissors and cut a wavy shape around the outside of your filters, this will give your flower the shape. After you have done that, open them back up. Use your fingers to gather the center of the coffee filters together. Give them a good pinch and staple the little gathering together. This will hold your filters in place as you shape your flower. Flip the filters over so the staple is at the bottom. Start gathering each layer towards the center (one at a time). Give each layer a pinch at the bottom to hold in place. Keep doing this until you have formed your entire flower. Once that is done you will have a little “nub” at the base of your flower. All you have to do next is take a little bit of tape and wrap it around to hold it in place. And that’s all there is to it! You can crinkle your filters up a bit to give it some more texture if you like also. Next, take your scissors and cut a wavy shape around the outside of your filters, this will give your flower it’s shape. If you are like me and need a visual, you can watch this video which is the same method that I described above. If you enjoyed this post be sure to check out our DIY board & new Mother’s Day board on Pinterest. You may also like this DIY Washer Pendant necklace, DIY Salt Dough Handprint, DIY chalkboard Frame and DIY Teacup Bird Feeder. « What Does “Spring Cleaning” Mean to You? Those are SO cute! You should come link those up on Wednesday at our Artsy Play Wednesday Linky! Great idea for a rainy day. i dont have any coffee filters but i never ever thought about making a flower out of one!! you are soo smart!! What a great idea! I wonder if you could colour them too. This a great craft to do with kids!